Before Beyonce, former First Lady and US Secretary of State Hillary Clinton arrived at Udaipur earlier this week to attend the pre-wedding festivities being organised in the city. Singer Beyonce arrived in Udaipur on Sunday as the city turns into a melting pot of renowned personalities from all walks of life ahead of the wedding ceremony of Isha Ambani and Anand Piramal. 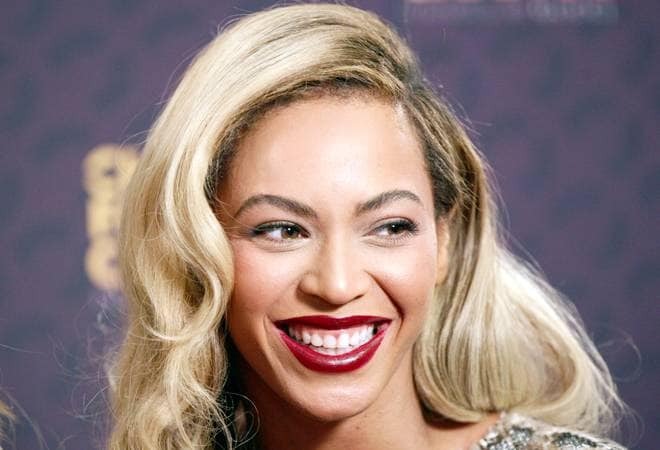 There have been reports that Beyonce will perform at the wedding ceremony in Mumbai next week, and is in Udaipur to attend the pre-wedding festivities. Before Beyonce, former First Lady and US Secretary of State Hillary Clinton arrived at Udaipur earlier this week to attend the pre-wedding festivities being organised in the city. Celebrities, including recently wedded Priyanka Chopra and Nick Jonas, Sachin Tendulkar and his wife Anjali Tendulkar, Salman Khan, Karan Johar, Varun Dhawan, Mahendra Singh Dhoni with his wife Sakshi and daughter Ziva, Vidya Balan with husband Siddharth Roy Kapoor, Aishwarya Rai Bachchan with Abhishek Bachchan, are already in the city to attend the pre-wedding festivities. Significant figures from the business world have also landed in Udaipur to be a part of the pre-wedding festivities, including Standard Chartered CEO Bill Winters, Goldman Sacchs Chairman and CEO Ken Hitchner, JP Morgan (Asia Pacific) Chairman & CEO Nicolas Aguzin, Ericsson CEO Borje Ekholm, Nokia CEO Rajeev Suri, and steel magnate Lakshmi Niwas Mittal. World Economic Forum Chairman Klaus Schwab, US diplomat Richard Verma, and Khalid A Al-Falih, Minister of Energy of Saudi Arabia and Saudi Aramaco chairman, will also attend the nuptials of Isha Ambani and Anand Piramal. Moreover, MIT President L Rafael Reif, and Professor Arogyaswami Paulraj of Stanford have also arrived in Udaipur on invitation from the Ambani family. In one of the key highlights of the pre-wedding functions of her daughter Isha Ambani's wedding with Anand Piramal, Nita Ambani, who is also Chairperson of Reliance Foundation, and Isha Ambani today visited Swadesh Bazaar, a curated showcase of 108 traditional Indian crafts and art forms, that were on display for the national and international guests attending the pre-wedding functions. 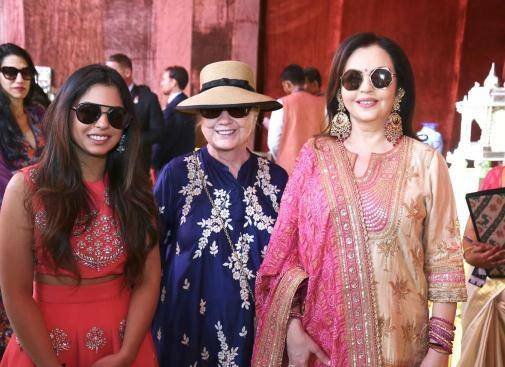 Nita Ambani and Isha Ambani along with Former First Lady Hillary Clinton at Swadesh Bazar. Presenting their art were master craftsmen and craftswomen themselves, who are keeping these traditional crafts alive. The whole exhibit created an interesting experience as also an immersion into the India's cultural heritage for the national and international guests, comprising of connoisseurs and several influential leaders from the world of business, arts and different walks of life. Showcasing some very intricate hand embroidery artists of Kantha from West Bengal; Chamba Rumal from Himachal Pradesh; Sujuni embroidery from Bihar; Gara Embroidery of the Parsi community; Crochet;Kashidakari from Kashmir; Embroideries of Kuchch; Phulkari from Punjab and Gota Patti from Rajasthan. 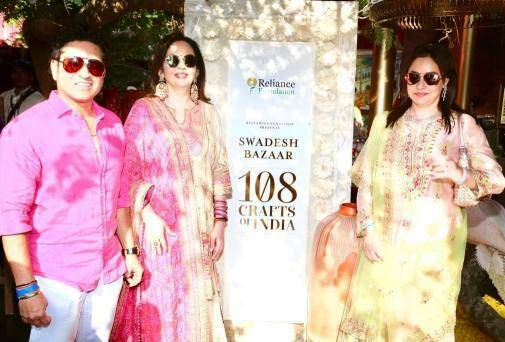 Nita Ambani with master blaster Sachin Tendulkar and Anjali Tendulkar at Swadesh Bazar. Swadesh Bazaar seeks to become a unique exhibit that not just provides livelihoods to thousands of artisans, but also gives them an opportunity to showcase rare works from every nook and corner of India, for people's interest, appreciation and support.